Sophia Shaver is a forward from Wayzata, Minnesota, who just finished her college hockey career with the University of Wisconsin. Before college, Shaver played for Wayzata High School. Over the course of her freshman and sophomore years in high school, Shaver recorded 35 points and achieved all-conference honors her freshman year. Then, as a junior, Shaver tallied 44 points in just 27 games. She earned both all-conference honors and all-state honorable mention honors. Her senior year, Shaver recorded 25 points in 19 games as she was named a finalist for the prestigious Minnesota Ms. Hockey Award. Internationally, Shaver was a member of the US. U-18 team that won gold at the 2015 IIHF U18 Women’s World Championships. During the tournament, she recorded one goal and two assists. Shaver also was invited to the 2014 U.S. Women’s National Team Training Camp and the U.S. Four Nations Training Camp during her time in high school. As a freshman at the University of Wisconsin, Shaver tallied 17 points in 40 games. She also finished the season with a plus-minus rating of plus-25 and 75 shots on goal. Shaver then improved to 18 points in 36 games as a sophomore with a plus-21 rating and 89 shots on net. Academically, Shaver was named to the WCHA All-Academic Team and Academic All-Big Ten Team her sophomore year. Shaver served as an alternative captain her junior year as she recorded 24 points in 35 games. Her 12 goals and 12 assists point total finished second on her team in scoring. Additionally, Shaver finished the season with 96 shots on net and a plus-17 rating. At the end of the season, Shaver was named to the All-WCHA Second Team and the WCHA All-Academic Team. This season, Shaver has served as one of the two team captains and has recorded 21 points in 41 games played, including the game-winning goal in the National Championship. At the end of the school year, Shaver will graduate from Wisconsin with a degree in real estate and urban land economics. The Minnesota Whitecaps drafted her ninth overall in the 2018 NWHL draft last December. Schammel scored a crucial goal in Friday’s Frozen Four semifinal victory over Cornell. Her goal came midway through the second period to give Minnesota a 1-0 lead that they did not lose as they ended up winning, 2-0. In Sunday’s championship game, Schammel’s season came to a disappointing end as Wisconsin shut out Minnesota 2-0. Schammel recorded two shots on net throughout the game. Shaver tallied a point in each game this weekend to help Wisconsin capture the national championship. In a dominant 5-0 semifinal win over Clarkson, Shaver assisted on a late goal with just one minute left in the game to extend Wisconsin’s game. She then scored the game-winning goal in the championship game on Sunday midway through the first period to help Wisconsin clinch the national title. Shaver also recorded four shots on goal and a plus-one rating during the game. Pankowski scored three out of Wisconsin’s seven goals this weekend en route to a national championship. She scored twice in the third period during Wisconsin’s semifinal win. Additionally, she recorded six shots on net and a plus-three rating. In the championship game, Pankowski scored a shorthanded beauty in the second period to pad Wisconsin’s lead. Loren Gabel, a forward for Clarkson, capped off an incredible season by being named the winner of the Patty Kazmaier memorial award as the top player in NCAA Division I women’s hockey. Gabel scored a nation leading 40 goals in just 37 games and recorded a total of 69 points. She is also Clarkson’s all-time leader in scoring as she has recorded 213 points in 160 career games. Gabel was named a First-Team AHCA All-American for the second season in a row as well. The Buffalo Beauts drafted Gabel eighth overall in the NWHL draft last December. 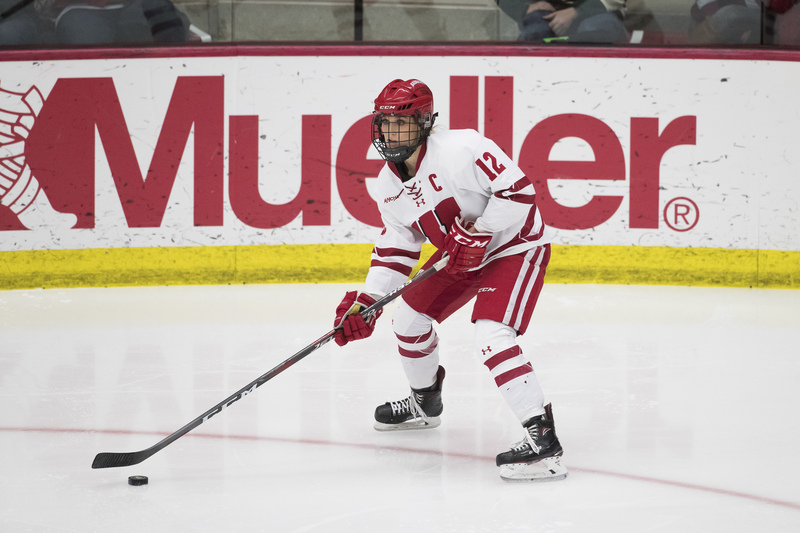 Annie Pankowski, a forward for Wisconsin, was named a First-Team AHCA All-American. She is only the third player in school history to earn three All-American honors as she is following the footsteps of Brianna Decker and Hilary Knight. Pankowski finished the season with 47 points. She was drafted first overall in the 2018 NWHL draft by the Metropolitan Riveters. Megan Keller, a defender for Boston College, earned First-Team AHCA All-American honors for the third time in her career. Keller lead all defenders in the national in almost every major statistical category this season. She had 43 points and also ranked in the top 20 among all skaters in the country in goals, assists, points, power play points, power play goals, game winning goals, and plus-minus. The Buffalo Beauts drafted Keller third overall in the 2018 NWHL draft. Lovisa Selander, a goaltender for RPI, was named as a First-Team AHCA All-American. This is the first time in program history that a player has earned an All-American honor. Selander finished the season with a 2.29 goals-against average and a 0.942 save percentage. Additionally, she made a total of 1,232 saves, good for the third most in NCAA Division I history. Selander was drafted 24th overall by the Boston Pride in the 2018 NWHL draft.